(Nanowerk News) University of California, San Diego electrical engineers are building a forest of tiny nanowire trees in order to cleanly capture solar energy without using fossil fuels and harvest it for hydrogen fuel generation. Reporting in the journal Nanoscale ("3D branched nanowire heterojunction photoelectrodes for high-efficiency solar water splitting and H2 generation"), the team said nanowires, which are made from abundant natural materials like silicon and zinc oxide, also offer a cheap way to deliver hydrogen fuel on a mass scale. "This is a clean way to generate clean fuel," said Deli Wang, professor in the Department of Electrical and Computer Engineering at the UC San Diego Jacobs School of Engineering. The trees' vertical structure and branches are keys to capturing the maximum amount of solar energy, according to Wang. That's because the vertical structure of trees grabs and adsorbs light while flat surfaces simply reflect it, Wang said, adding that it is also similar to retinal photoreceptor cells in the human eye. In images of Earth from space, light reflects off of flat surfaces such as the ocean or deserts, while forests appear darker. Wang's team has mimicked this structure in their "3D branched nanowire array" which uses a process called photoelectrochemical water-splitting to produce hydrogen gas. Water splitting refers to the process of separating water into oxygen and hydrogen in order to extract hydrogen gas to be used as fuel. This process uses clean energy with no green-house gas byproduct. By comparison, the current conventional way of producing hydrogen relies on electricity from fossil fuels. "Hydrogen is considered to be clean fuel compared to fossil fuel because there is no carbon emission, but the hydrogen currently used is not generated cleanly," said Ke Sun, a PhD student in electrical engineering who led the project. By harvesting more sun light using the vertical nanotree structure, Wang's team has developed a way to produce more hydrogen fuel efficiently compared to planar counterparts. Wang is also affiliated with the California Institute of Telecommunications and Information Technology and the Material Science and Engineering Program at UC San Diego. In this experiment, nanotree electrodes are submersed in water and illuminated by simulated sun light to measure electricity output of the device. Photo Credit: Joshua Knoff, UC San Diego Jacobs School of Engineering. The vertical branch structure also maximizes hydrogen gas output, said Sun. For example, on the flat wide surface of a pot of boiling water, bubbles must become large to come to the surface. In the nanotree structure, very small gas bubbles of hydrogen can be extracted much faster. "Moreover, with this structure, we have enhanced, by at least 400,000 times, the surface area for chemical reactions," said Sun. 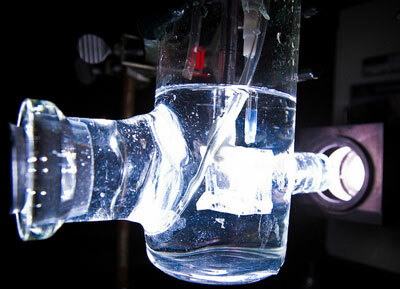 In the long run, what Wang's team is aiming for is even bigger: artificial photosynthesis. In photosynthesis, as plants absorb sunlight they also collect carbon dioxide (CO2) and water from the atmosphere to create carbohydrates to fuel their own growth. Wang's team hopes to mimic this process to also capture CO2 from the atmosphere, reducing carbon emissions, and convert it into hydrocarbon fuel. "We are trying to mimic what the plant does to convert sunlight to energy," said Sun. "We are hoping in the near future our 'nanotree' structure can eventually be part of an efficient device that functions like a real tree for photosynthesis." The team is also studying alternatives to zinc oxide, which absorbs the sun's ultraviolet light, but has stability issues that affect the lifetime usage of the nanotree structure.